Ed Rosen, is a beloved man of opera and cherished friend to so many singers, especially me! I love him like family. He gives access to so many old and new listeners live performances through his thriving Premiere Opera, Ltd. and Premiere Opera Podcasts, (POP) which specialize in DVD’s and CD’s of live performances from all over the world as well as legendary evenings of the great singers and conductors of the past. A veritable “Time Capsule” is in his hands and many fans and performers alike are grateful to him for keeping the history alive to inform and delight us all. Mr. Rosen has a spectacular baritone voice and is himself on CD and DVD with the no less than the legendary Montserrat Caballe, Jose’ Carreras, and Katia Ricciarelli. God love and thank you, Ed. I know I do. “I was first hooked at about 15 years old, when a friend played me scenes from Boheme from an RCA highlight recording with Di Stefano and Albanese, recorded in 1951 I already liked The Student Prince LP with Mario Lanza, and was told that if I like The Student Prince, wait until I hear Boheme, Traviata, etc. I started going to the Met almost immediately, and was so fortunate to be able to see so many great singers all singing at the same time. The Met had Tebaldi, Milanov, Albanese, Stella, soon Tucci, Scotto, Price, Peters, and so many others. Tenors included Del Monaco, Tucker, Bjoerling, Bergonzi, Peerce, Corelli, etc. Baritones were Merrill, Warren, MacNeil, Bastianini, and bassos were Siepi, Hines, Tozzi, etc. I couldn’t have gone wrong. On any given night, one or more of these all time greats was singing. Also the mezzo, Simionato, who made a tremendous impression in the 10 times or so that I saw her. I feel that opera can really elevate the spirit and the soul. No matter what is going on in our personal world, Butterfly will always tug at our heartstrings. We can get away from the things that sometimes drag us down in life. We can “escape.” But what a healthy, rewarding, escape. Aida will always thrill, and send shivers up one’s spine. A good Forza, and I saw many, was always an incredible evening of singing. Just choose your casts from some of the names above, and yes, I saw them in Forza, and countless other operas. 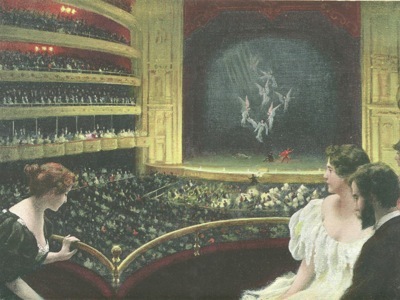 During more recent years, my love for opera hasn’t waned, but the level of singing is generally nowhere near the same as it was for the first 20 or so years that I attended the opera. Still, among the things I enjoy the most is introducing young opera lovers to the voices that I grew up on, and, in a sense, rediscover singers such as Tebaldi or Corelli through the eyes of a youngster who never could have heard them live. My entire adult life has been devoted to opera, and my great fortune is to have been able to work for a living in the field of opera. Next year it will be 40 years that I have been doing this. I simply cannot imagine what course my life would have taken if I had not discovered opera. It has enriched me beyond description, and, in many ways, it continues to. When that stops, I guess I will stop going, but I can never give up my love for Mr. Verdi, Mr. Puccini, etc.